In this episode of Confetti Park, we meet Deborah A. Anderson, New Orleans based animator and creator of The Black Hair Alphabet, a children’s book that explores different African-American hairstyles from A-Z. In this interview, Deborah discusses why and how she created the book, and shares insight into the interesting worlds of video game avatars, 3D illustration, and the animation industry. Deborah decided to blog about a different black hair style for each day of the month during Black History Month, starting with a different letter of the alphabet, to explore the versatility of black hair. Each day during February 2017, she spent approximately three hours illustrating a different hairstyle inspired by a letter—A for Afro. B for Bantu Knot, C for Conk., etc. At the end of the month, she had the material for a book! Deborah, who is primarily an animator (she has created background scenes for Family Guy, the Cleveland Show, Batman, Scooby Doo) created her illustrations using a 3D animation software. 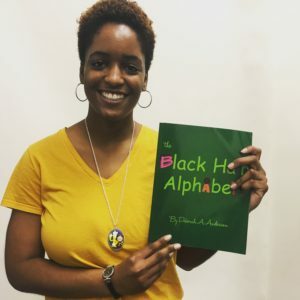 She published The Black Hair Alphabet on Amazon. You can purchase it in print or for Kindle. Check out blkwmnanimator.com for more information about Deborah and her work! Thank you so much Deborah, for sharing your story with Confetti Park. Listen to Deborah narrate the entire book in this episode of Confetti Park Storytime!